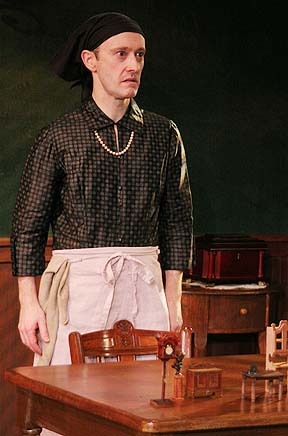 Andrew Sellon won a lot of fans in 2005 with his engaging performance as the title character in the Vermont Stage production of the comedic play “The Foreigner.” He’ll be winning a lot more fans in the coming days with his latest impressively versatile Vermont Stage role as a really foreign foreigner. 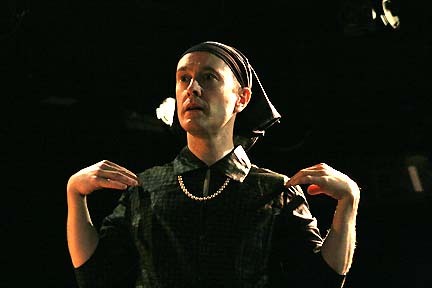 Sellon is the lone, multi-character performer in “I Am My Own Wife,” which tells the improbable based-in-fact tale of an East German man who survives both the oppressive Nazi and Communist regimes while dressed as a woman named Charlotte von Mahlsdorf. 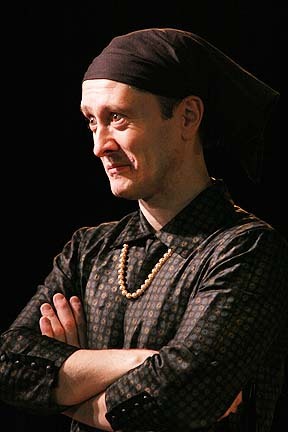 Sellon spends most of his time in “I Am My Own Wife” as Charlotte, clad in a black peasant dress, apron, pearls, orthopedic shoes and a kerchief on her head. She tells Wright, and the audience, of her exotic life in Berlin, from her dangerously abusive father to her acceptance as a teen of her transvestism, and then about how she narrowly escaped death at the hands of the Nazis and managed to maintain an underground Bohemian gathering place for Berlin’s gay-and-lesbian population inside her beloved antique-furniture museum despite the prying eyes of the Stasi, the Communist secret police in East Germany during the Cold War. Wright, a gay man from the American Bible Belt, is captivated by Charlotte’s tale of living as a homosexual in a hostile atmosphere. Reunited Germany is captivated, too; the country celebrates Charlotte as a heroine after the fall of the Berlin Wall. Wright’s plans for a play, Charlotte’s story and her sudden celebrity status all start to unravel as details of her secret Stasi file start to emerge: She apparently betrayed a fellow homosexual and lover of antiques who illegally sold old clocks to American soldiers. 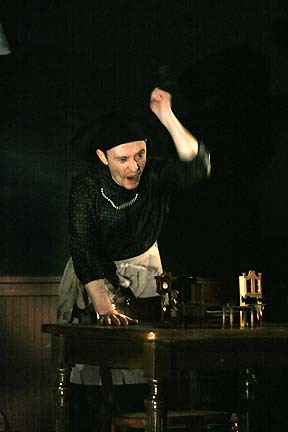 Wright grapples to find the truth as the entire country begins to have doubts (one of Charlotte’s previous supporters now says that every time she yawns, a lie begins to form) and reconcile his admiration for her with his newfound uncertainty over Charlotte’s life, a life she acknowledges she lived in this order of priorities: museum, furniture, men. Sellon conveys all these conflicting emotions impeccably. It’s the rare one-actor play that doesn’t feel like a one-actor play, but his performance is so varied, it’s easy to forget he’s going it alone. 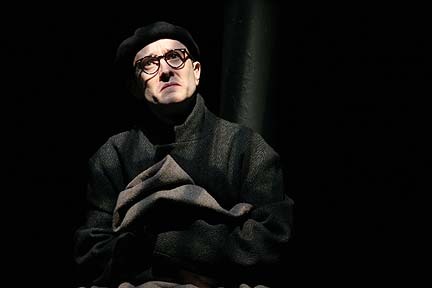 He slides gracefully from an inquisitive American playwright to a demure but controversial elderly German transvestite to a glib TV talk-show host who welcomes Charlotte to his set, and (thanks to the production’s dialect coach, Gillian Lane-Plescia) never slips into an accent that rings untrue. It’s a one-man play, but Sellon had a lot of help. Director Sara Lampert Hoover keeps the pacing quick and tight. The lighting designer, Caleb Jon Magoon, employs creative fades that set the scene and take some of the storytelling pressure off of Sellon. Scenic designer Jeff Modereger created a set of simple elegance centered around the museum that Charlotte runs and loves with all her heart. The tastefully sedate hunter-green walls double as a scrim that reveals a secondary set showing the depth of Charlotte’s obsession for the objects that define her life. Those objects, in fact, might be the only things that are what they seem in Charlotte’s life, as she purposefully keeps all the nicks and scratches intact to reveal their true history. 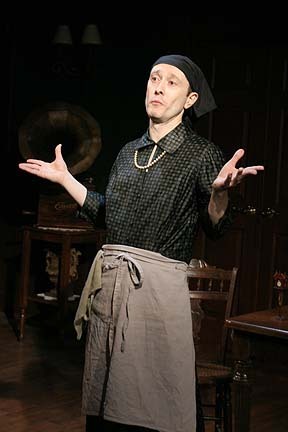 The real star of “I Am My Own Wife,” though, is Sellon, as he takes the dust covers off of Charlotte and reveals her history in all its complex glory. 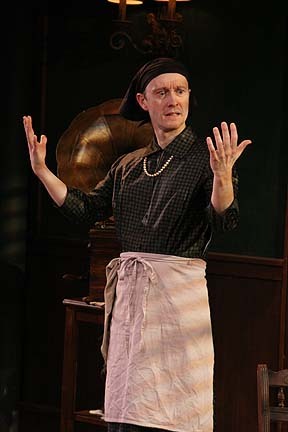 Vermont Stage Company’s current production, starring the gifted Andrew Sellon, lives up to Charlotte’s memory: It’s vibrant, elegant and just a bit cheeky. 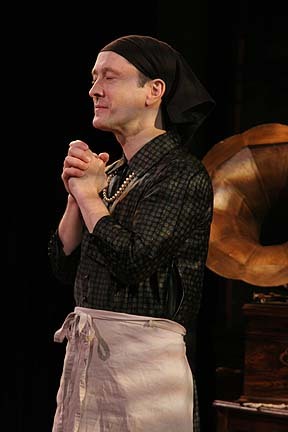 I Am My Own Wife calls for one actor to play 35 characters and conjure a virtuosic range of accents and emotions — all while wearing a dress. 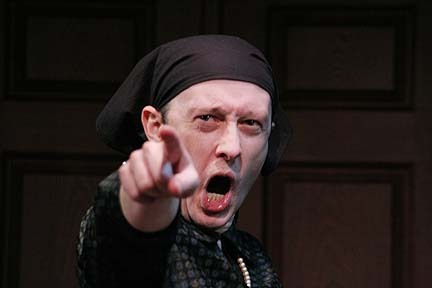 Andrew Sellon excelled at every aspect of the demanding role. He played Charlotte with subtle feminine grace, never resorting to campy, drag-queen clichés. Refinement characterized her gestures and speech. Sellon’s eyes remained demure as Charlotte, relinquishing their shyness only when they widened with passion for a particularly vivid, often furniture-related, memory. 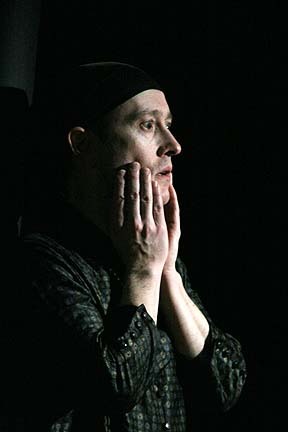 Vocal shifts — changes in pitch, volume and tone, as well as accent — offered a way for Sellon to move between characters without changing costumes. Charlotte’s voice was higher, softer and more measured than that of eager-beaver New Yorker Doug, whose fast-paced speech bubbled with enthusiasm. Sellon delivered journalist John Marks’ Texas twang with a newsman’s This-Just-In urgency. He reserved the deepest timbre for Lothar’s nasty father. The audience was pin-drop quiet during the father-son confrontation. Sometimes it was hard to remember that the palpable presence of every character came from just one actor. Like a skater whose routine uses every inch of the ice, Sellon took advantage of every part of the stage. The most important interaction is the back-and-forth between Doug and Charlotte during interviews. Lampert Hoover’s direction emphasized their physical ebb and flow across the set as the emotional stakes between them intensified. Outstanding production elements placed Charlotte in the polished surroundings she would have appreciated — and insisted on — while they also supported Sellon’s remarkable performance. VSC: Why did you want to do this play? AS: Gosh, lots of answers to this one. I think any actor would say that in part, like the Matterhorn, because it’s there. A solo, multi-character piece like this is an exhilarating challenge for any performer – the kind of gift that just doesn’t come along very often. On a more personal level, as a gay man, I’ve faced my own share of the world’s challenges to my identity over the years — some of them violent. 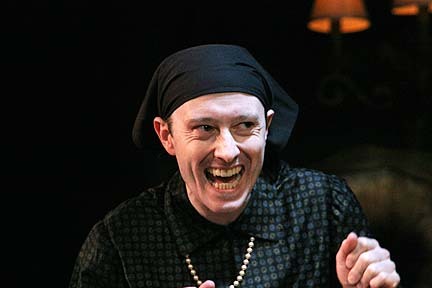 But as with Doug, the gay playwright/narrator of the piece, my experiences pale in comparison to what Charlotte survived. I wanted to get in there, inside Charlotte’s being to the best of my ability, to learn from her strength and understand her choices as much as I could. As Doug says to her at one point, “You are teaching me a history I never knew I had.” That resonates deeply for me, and it’s the main reason I was determined to do this play. And to be able to do it at VSC makes it that much more perfect. 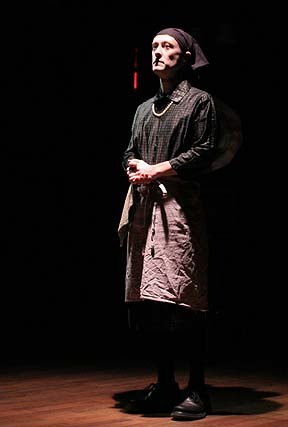 VSC: In the play, we learn that Charlotte is perhaps not all that she seems to be. What do you make of her apparent duplicity? AS: In the course of the piece, I play Charlotte, her friends and also her detractors. So I have to understand and embody not just Charlotte herself, but also those conflicting perspectives. I think the playwright’s great (and rather daring) accomplishment is to leave it to the audience to decide what to make of Charlotte’s story. I will say that while I admired the Broadway production, I will be making some different choices for Charlotte. Sara, the director, and I are finding our own answers, our own Charlotte, and the text is sophisticated enough to allow for that. I’m excited to see how the VSC audience will respond to our version. ALFRED - BETRAYED BY CHARLOTTE? VSC: It’s early in the rehearsal process, but what are the challenges and rewards you’ve faced so far? AS: First challenge: getting into the dress. Literally. For scheduling reasons, the first fitting took place at my gym in mid-town Manhattan. Luckily, most members there are performers and pretty much unfazed by anything, but there was a surreal moment when I found myself standing in front of the mirrors in the men’s locker room wearing just my slacks, and struggling helplessly to pull that skinny black floral-print dress over my head & shoulders without drawing attention to myself. I finally had to go out to the lobby and ask the costume designer how a woman does it! But it was a very informative identity experience, trying to don that new skin literally. Second, the dialects have been a fun challenge; and I’m so grateful that VSC arranged for coaching with expert Gillian Lane-Plescia, she was fantastically helpful. I’ve always loved dialects, and this play is a festival of them. Third, I’m playing 35 different people. Now that’s a challenge. But you know what? The challenges are the rewards. This is my Olympics, and I’m competing in every event. VSC: Can you make any comparisons between the life Charlotte led and the life one leads as an actor? AS: Hmm. Well, I suppose the average person looking at the real Charlotte in her housefrau dress and practical shoes probably thought “Oh, there’s a crazy guy in a costume.” But to Charlotte, transvestism was the norm. She did occasionally get dolled up in more stereotypical “drag” for a particular party or event, but that was unusual for her. She put on everyday women’s clothing to become who she instinctively believed she really was. While it’s true that as an actor I put on a costume to become someone else, I believe in and am in part defined by the physical exterior I adopt, just like Charlotte. So I’d say in that sense, we’re kindred spirits. VSC: You’ve done a one man show before, based on the life of Lewis Carroll. How does this compare? AS: For my solo Lewis Carroll play, because I did all the research, all the drafts and redrafts, when it came time to memorize the final version for performance, and voice all the different characters, it was a lot easier because I’d been breathing it day & night for months and months. 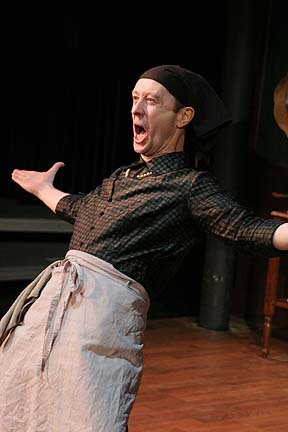 For I Am My Own Wife, playwright Doug Wright had that “birthing” experience. Granted, working on an existing script written by someone else is the typical process for an actor. But given the richness and complexity of this piece, I’m glad I’ve had a few months to work on absorbing it. VSC: What have you learned about yourself as an actor and as a person in the process of working on this show? AS: I’m still learning from Charlotte, Doug and the other characters about making tough choices, and accepting the consequences of where they lead. We all create and live our own stories every day; like Charlotte, sometimes we’re forced to make painful compromises, and perhaps in order to live with them, we may end up making our own truths. I think it’s how we get through the day. This play is also making me think a lot about redefining bravery. Whatever conclusions the individual members of the audience draw about Charlotte at the end of the performance, I hope they’ll share my admiration for one of the most unique and extraordinary survivors the world has ever known. And I have learned something else: A loose-fitting housedress hides love handles quite nicely. Charlotte was no dummy. VW: You said that while you admired the Broadway production, you will be making some different choices for Charlotte. Can you elaborate on this, and give some specific examples of the differences you will bring? AS: Anytime an actor plays a character, he or she is “channeling” that character through [his/her] own personal experience, and unique physicality and voice. So we are not trying to copy the Charlotte of the Broadway production, and I am not trying to mimic the voices of the real Charlotte or Doug. I did read Charlotte’s autobiography, and also watched her autobiographical film to see and hear her in action, but more to find jumping off points through which I can interpret her. After seeing film footage of the real Charlotte, Sara and I agreed that we wanted to capture more of her puckish charm, and not make her overtly a cipher on the surface. 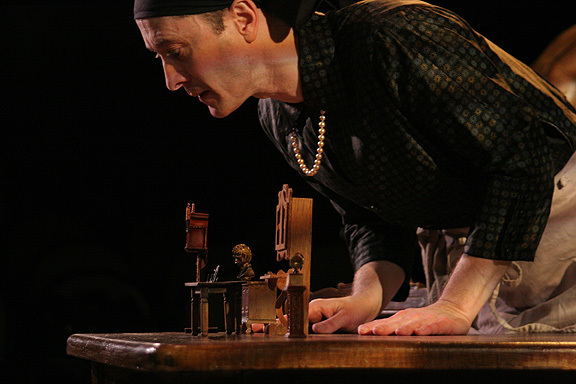 We think the heightened difference between the genuinely charming surface and the darkness underneath is part of what gives our production an extra depth, and we feel that our interpretation of Charlotte is very much in the service of the character that Doug Wright has written. VW: You said one line in the play, spoken by the character of Doug, resonates deeply for you – “You are teaching me a history I never knew I had” – and is the main reason you were determined to do this play. Would you elaborate about that shared history? AS: I’m a gay man, and over the years I have at times had to verbally and/or physically defend my right to be who I am. Frankly, some of my own experiences are still too painful for me to speak about easily. So to hear Charlotte’s amazing stories about her struggles and triumphs as a gay transvestite, surviving not just the Nazis but the Communists as well, reminds me that I too am part of ongoing gay history, part of the ongoing struggle for equality and acceptance. I hope that by extension everyone who sees this play — even those with differing beliefs — will see something of themselves in Charlotte’s desire to be accepted exactly “as is”. What other parts of Charlotte’s history I may share, I will leave to the audience’s imagination! VW: I love what you say about this being “your Olympics and that you are competing in all the events.” What could we call the flying triple axel moment of the play – in other words, what moment in the play is the most difficult to negotiate – what series of character interactions? AS: Some moments in the play are technically challenging, for instance a conversation between two or more people. Others are challenging in the emotional depths they plumb. There’s a lot of humor in this play, but also a lot of passion. Charlotte led an extraordinary life no matter how you look at it. I don’t want to spoil any surprises for those who have not seen the play, and I’d rather not have people come to the play looking for specific “acting” moments, so I’ll just say “come and see the whole story unfold!” It’s about the story, after all — and this is a great one. VW: What are ways you have prepared for this play – and/or specific characters – that go beyond studying dialects and committing lines to memory? AS: Every actor goes about the preparation process differently. And, of course, preparation is just to give you a launching pad for those moments of impulse and insight that can only be found in on-your-feet rehearsal and live performance. I generally pull bits of inspiration from all sorts of places when I work on a role — the script is first, of course, plus other texts, visual images, objects, music, clothing — you name it. It’s all grist for the mill, and I just surround myself with it all to see what generates impulses and opens windows, and then I go from there with the director and the designers. In addition to absorbing Charlotte’s book and film, I did some research into the time periods and politics involved, looked at pictures of old furniture, and listened to a lot of period recordings that Charlotte would have played on her beloved phonographs. The director and I went on a “field trip” to an exhibit of Weimar-era portraits at the Metropolitan Museum of Art. I also watched a lovely, bittersweet film called “Coming Out” that was the first gay-themed film to make it out of Eastern Berlin, in the 80’s, which gave a real feel for the challenges of being gay in that time and place. Charlotte actually appears briefly in that film as a chatty red-headed barmaid version of herself, which is an entertaining bonus. I’ve been wearing the Charlotte costume since the first day of rehearsal, which is always very helpful to me. I work from the inside and the outside simultaneously. VW: You’re playing 35 different people. Who are the two or three most challenging characters of the play, and why? AS: Charlotte alone would be enough of a challenge for any actor! She is quite the conundrum. Any actor and director team working on her must examine the evidence as presented in the play, form some decisions about what Charlotte did or didn’t do, and then follow that through in interpreting the rest of the play. Other characters can be challenging for the opposite reason — they may appear for only a single sentence, but they must be flesh-and-blood within that one sentence. 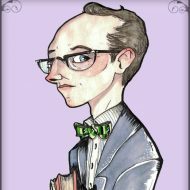 VW: Doug Wright referred to Charlotte as “a complete and vexing mystery” – what are your thoughts? AS: That about sums it up! The rest is in the playing –the audience will enjoy taking the journey for themselves, and I’m sure it will provide for a lot of lively post-performance discussions around town. VW: You say the dialects have been a “fun challenge” – what was the toughest, and why? One scene includes a press conference with questions being asked by journalists from several different countries – this is one exacting playwright! AS: Ironically, the Midwestern voicings for a couple of minor characters were more challenging for me initially than the other half-dozen or so nationalities that appear in the play! And Russian also has a particular glottal “L” sound that is not used in the U.S. 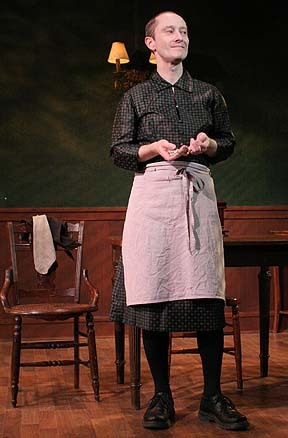 But I was lucky to be born with a good ear for dialects, and Vermont Stage arranged for me to have some great coaching with expert Gillian Lane-Plescia, who works with performers on Broadway and all over the world. My friend Katja Karner in Western Germany has also been acting as a sounding board. Of course dialects are only a means to an end — the play is about the people and their views; the dialects just tell you from whence those views originate. This is very much a global story, actually. VW: For you, is this play about Charlotte von Mahlsdorf, or more about an idea than a specific person? AS: It’s about both. It’s about Charlotte and Doug, and through them about self-discovery, the definition of courage, the price of survival, and our need to find perfect heroes. But truly, the best “explanation” I can give is in the performance itself. 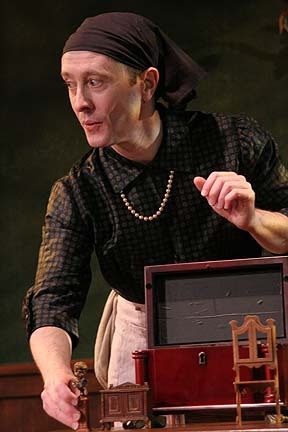 I look forward to sharing Charlotte, Doug, and the other 33 characters of I Am My Own Wife with Vermont audiences!